Assistant Professor Joshua Vaughan and Professor Daniel Chiu are among the eight awardees selected by the National Institutes of Health (NIH) for a 2017 NIH Director’s Transformative Research Award. This program is one of four in the NIH High-Risk, High-Reward Research program, which funded 86 awards to scientists working in biomedical research in 2017. The NIH High-Risk, High-Reward Research program funds exceptionally creative scientists proposing to use highly innovative approaches to tackle major challenges in biomedical research. The program accelerates scientific discovery by supporting high-risk ideas with high-impact potential, and applicants are encouraged to think outside the box and to pursue exciting, trailblazing ideas in any area of research relevant to the NIH mission. Professors Chiu and Vaughan are developing radical new technologies for high-resolution mapping of brain tissue, including circuit-level spatial information down to a resolution of 50 nanometers and comprehensive analysis of the types of proteins present across large regions of the brain. These techniques are needed because it is technically difficult to directly detect large numbers of proteins in brain tissue. Instead of trying to measure proteins directly, most approaches measure RNA molecules—a precursor to proteins. But RNA detection in spatially complex brain tissue has its flaws. Current approaches struggle with dim signals that are difficult to detect over background noise in complex, thick tissues. Professors Chiu and Vaughan will develop new fluorescent probes to light up RNA molecules in tissues and will use a novel, large-area light sheet microscope—together with sample processing techniques—to rapidly probe large volumes of brain tissue at high spatial resolution. 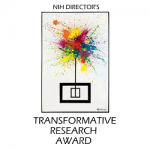 The work of 2017 NIH award recipients will be featured at the 2018 High-Risk, High-Reward Research Symposium, held June 6-8, 2018 in Bethesda, MD. The symposium is free, open to the public, and will bring together recipients of the NIH Director’s Pioneer, New Innovator, Transformative Research, and Early Independence awards to share their groundbreaking research and discoveries. To learn more about Professor Chiu and his research, please visit his faculty page and research group website. To learn more about Professor Vaughan and his research, please visit his faculty page and research group website. Adapted by Diana Knight from a October 6, 2017 story by Jennifer Langston of UW News and Leila Gray of UW Health Sciences/UW Medicine.